The Harwood Fire Station in GTA III. 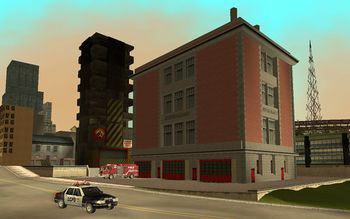 The Harwood Fire Station is, as the name states, a fire station located in Harwood, Portland, Liberty City. It appears in both Grand Theft Auto III and Grand Theft Auto: Liberty City Stories. 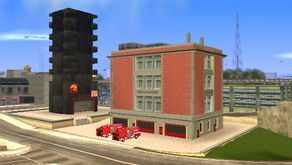 It is one of the three fire stations in Liberty City, the other two are located in Francis International Airport and Belleville Park. Located in Harwood, a district of Portland, the fire station serves as the fire station of Portland island. The station itself is medium sized, occupying a tall, brown rectangular-prism shaped building with three gates. Like the fire stations in Francis International Airport and Belleville Park, it is inaccessible to the player without the use of modifications, trainers and hacks. A Firetruck spawns in front of one of its gates in both renditions. This page was last modified on 21 July 2015, at 19:39.